Alfred is now almost 3 years old and has been built from the top down, with many wonderful new features being added throughout his life. 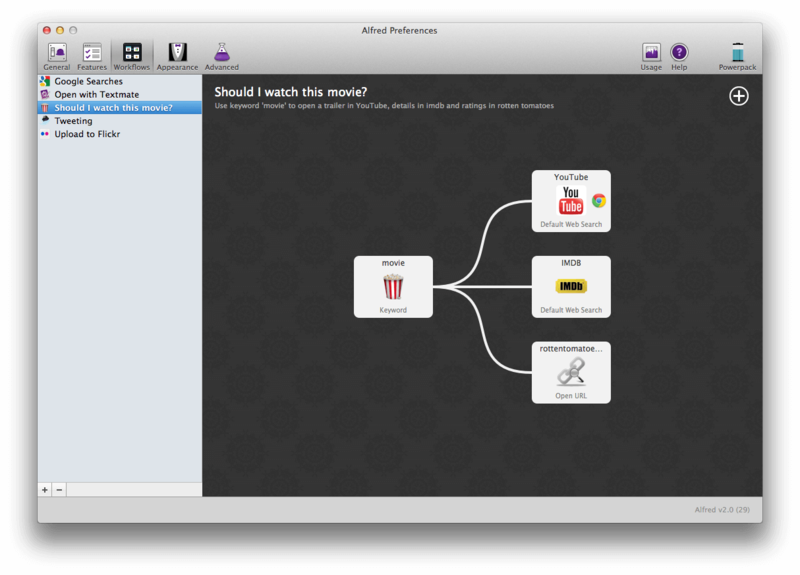 Over time, it has been getting harder and harder to keep Alfred's preferences usable and approachable for new users. Around a year ago, I decided it was time for some big changes... and by big changes, I mean, rethinking Alfred's architecture from the ground up with a brand new foundation, on top of which all of his features are built - I started to plan Workflows. Workflows are process containers of interconnected processing objects (haha I just made that up, sounds posh eh?). Put simply, you have triggers, inputs, actions and outputs, which can be mashed together into really useful stuff. There are loads of great built-in objects, so non-technical users can simply pop these objects onto the canvas, connect them together and use their workflow. Not a line of code in sight. Even better? 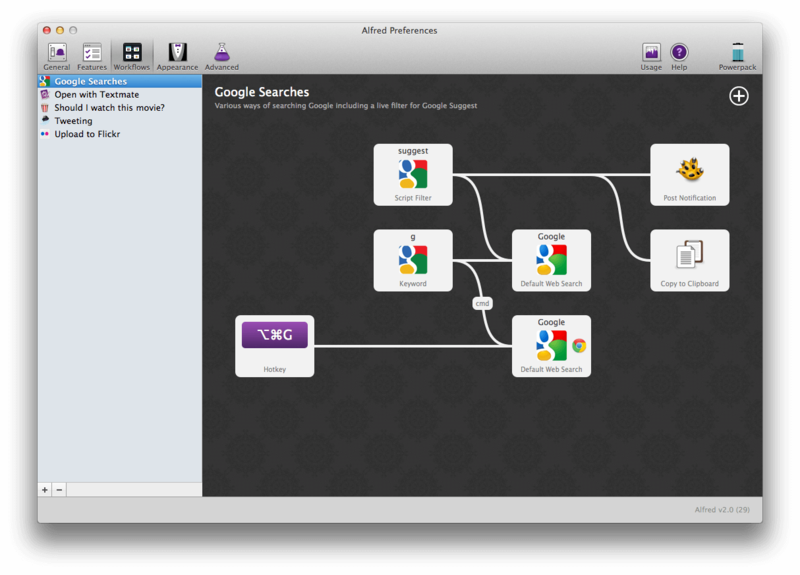 Developers can create their own custom objects to process information in any way they like, including live filters feeding directly back into Alfred's results. Movies weren't created equal, so before I start watching a movie, I can search for "movie dark knight rises" to decide whether or not I should watch it. This will launch a YouTube search for the trailer in Chrome (because I don't have Flash installed in Safari), an IMDB search using a default web search, and a Rotten Tomatoes custom search I've created. Using the "flickr" filter narrows the Alfred results to only image files. 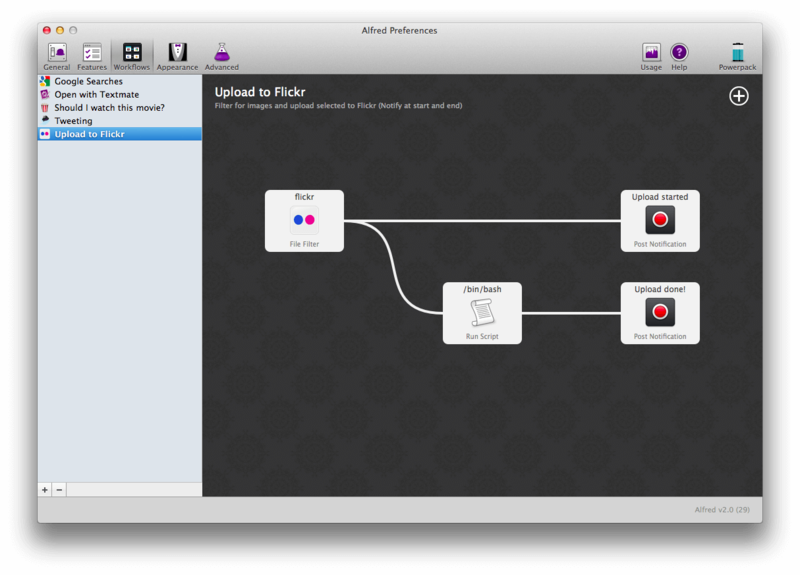 Once I've found the image I want, the workflow uploads it to Flickr using the script I've added. It notifies me when the upload starts, and again when the upload has completed. No need to refresh the Flickr page repeatedly to check if it's done, Alfred will let you know! This one has a few ways to start the search, using both hotkeys and keywords. Using the keyword "suggest" feeds Google Suggest results back into Alfred using a script filter - This is a new and extremely powerful v2 feature, allowing developers to feed results dynamically back into Alfred. Once I've found the result I want, hitting return will search Google. And just because I can, it'll also post a notification to Growl and copy the suggestion to Clipboard. Alternatively, I can launch a Google web search using the "g" keyword. Holding the Cmd modifier when hitting return, or using the Cmd + Alt + G hotkey opens the web search in Chrome instead. These are just a few examples of what can be created with the new Workflows, and they barely scratch the surface of what you'll be able to do with them. Over the coming weeks, we'll be posting a few more sneak peeks like this to share some of the v2 features. If you want to take part in the v2 beta in January, you can upgrade your v1 single user license to Mega Supporter or buy a new Mega Supporter license today.